1 A None No Power Seat 1 A is a standard Business Class Bulkhead seat. 1 D None No Power Seat 1 D is a standard Business Class Bulkhead seat. 1 F None No Power Seat 1 F is a standard Business Class Bulkhead seat. 1 H None No Power Seat 1 H is a standard Business Class Bulkhead seat. 20 A None No Power Seat 20 A is a standard SAS Plus bulkhead seat whose proximity to the lavatories and galleys may be bothersome. The position of the bassinets may also be bothersome. The tray table is in the armrest, making the armrest immovable and slightly reducing seat width. There is no floor storage for this seat during take-off or landing. 20 B None No Power Seat 20 B is a standard SAS Plus bulkhead seat whose proximity to the lavatories and galleys may be bothersome. The position of the bassinets may also be bothersome. The tray table is in the armrest, making the armrest immovable and slightly reducing seat width. There is no floor storage for this seat during take-off or landing. 20 D None No Power Seat 20 D is a standard SAS Plus bulkhead seat whose proximity to the lavatories and galleys may be bothersome. The position of the bassinets may also be bothersome. The tray table is in the armrest, making the armrest immovable and slightly reducing seat width. There is no floor storage for this seat during take-off or landing. 20 E None No Power Seat 20 E is a standard SAS Plus bulkhead seat whose proximity to the lavatories and galleys may be bothersome. The position of the bassinets may also be bothersome. The tray table is in the armrest, making the armrest immovable and slightly reducing seat width. There is no floor storage for this seat during take-off or landing. 20 F None No Power Seat 20 F is a standard SAS Plus bulkhead seat whose proximity to the lavatories and galleys may be bothersome. The position of the bassinets may also be bothersome. The tray table is in the armrest, making the armrest immovable and slightly reducing seat width. There is no floor storage for this seat during take-off or landing. 20 G None No Power Seat 20 G is a standard SAS Plus bulkhead seat whose proximity to the lavatories and galleys may be bothersome. The position of the bassinets may also be bothersome. The tray table is in the armrest, making the armrest immovable and slightly reducing seat width. There is no floor storage for this seat during take-off or landing. 20 H None No Power Seat 20 H is a standard SAS Plus bulkhead seat whose proximity to the lavatories and galleys may be bothersome. The position of the bassinets may also be bothersome. The tray table is in the armrest, making the armrest immovable and slightly reducing seat width. There is no floor storage for this seat during take-off or landing. 21 A None No Power Seat 21 A is a standard SAS Plus seat. 21 B None No Power Seat 21 B is a standard SAS Plus seat. 21 D None No Power Seat 21 D is a standard SAS Plus seat. 21 E None No Power Seat 21 E is a standard SAS Plus seat. 21 F None No Power Seat 21 F is a standard SAS Plus seat. 21 G None No Power Seat 21 G is a standard SAS Plus seat. 21 H None No Power Seat 21 H is a standard SAS Plus seat. 22 A None No Power Seat 22 A is a standard SAS Plus seat that is missing a window. 22 B None No Power Seat 22 B is a standard SAS Plus seat. 22 D None No Power Seat 22 D is a standard SAS Plus seat. 22 E None No Power Seat 22 E is a standard SAS Plus seat. 22 F None No Power Seat 22 F is a standard SAS Plus seat. 22 G None No Power Seat 22 G is a standard SAS Plus seat. 22 H None No Power Seat 22 H is a standard SAS Plus seat that is missing a window. 23 A None No Power Seat 23 A is a standard SAS Plus seat. 23 B None No Power Seat 23 B is a standard SAS Plus seat. 23 D None No Power Seat 23 D is a standard SAS Plus seat. 23 E None No Power Seat 23 E is a standard SAS Plus seat. 23 F None No Power Seat 23 F is a standard SAS Plus seat. 23 G None No Power Seat 23 G is a standard SAS Plus seat. 23 H None No Power Seat 23 H is a standard SAS Plus seat. 24 A None No Power Seat 24 A is a standard SAS Plus seat. 24 B None No Power Seat 24 B is a standard SAS Plus seat. 24 D None No Power Seat 24 D is a standard SAS Plus seat. 24 E None No Power Seat 24 E is a standard SAS Plus seat. 24 F None No Power Seat 24 F is a standard SAS Plus seat. 24 G None No Power Seat 24 G is a standard SAS Plus seat. 24 H None No Power Seat 24 H is a standard SAS Plus seat. 25 A None No Power Seat 25 A is a standard SAS Plus seat. 25 B None No Power Seat 25 B is a standard SAS Plus seat. 25 D None No Power Seat 25 D is a standard SAS Plus seat. 25 E None No Power Seat 25 E is a standard SAS Plus seat. 25 F None No Power Seat 25 F is a standard SAS Plus seat. 25 G None No Power Seat 25 G is a standard SAS Plus seat. 25 H None No Power Seat 25 H is a standard SAS Plus seat. 26 A None No Power Seat 26 A is a standard SAS Plus seat. 26 B None No Power Seat 26 B is a standard SAS Plus seat. 26 D None No Power Seat 26 D is a standard SAS Plus seat. 26 E None No Power Seat 26 E is a standard SAS Plus seat. 26 F None No Power Seat 26 F is a standard SAS Plus seat. 26 G None No Power Seat 26 G is a standard SAS Plus seat. 26 H None No Power Seat 26 H is a standard SAS Plus seat. 27 A None No Power Seat 27 A is a standard SAS Plus seat. 27 B None No Power Seat 27 B is a standard SAS Plus seat. 27 D None No Power Seat 27 D is a standard SAS Plus seat. 27 E None No Power Seat 27 E is a standard SAS Plus seat. 27 F None No Power Seat 27 F is a standard SAS Plus seat. 27 G None No Power Seat 27 G is a standard SAS Plus seat. 27 H None No Power Seat 27 H is a standard SAS Plus seat. 30 A None No Power Seat 30 A is a standard Economy Class seat that may have extra legroom due to the position of the bulkhead. The tray table is in the armrest, making the armrest immovable and slightly reducing seat width. There is no floor storage for this seat during take-off or landing. 30 B None No Power Seat 30 B is a standard Economy Class seat that may have extra legroom due to the position of the bulkhead. The tray table is in the armrest, making the armrest immovable and slightly reducing seat width. There is no floor storage for this seat during take-off or landing. 30 C None No Power Seat 30 C is a standard Economy Class seat that may have extra legroom due to the position of the bulkhead. The tray table is in the armrest, making the armrest immovable and slightly reducing seat width. There is no floor storage for this seat during take-off or landing. 30 D None No Power Seat 30 D is a standard Economy Class seat that may have extra legroom due to the position of the bulkhead. The tray table is in the armrest, making the armrest immovable and slightly reducing seat width. There is no floor storage for this seat during take-off or landing. 30 E None No Power Seat 30 E is a standard Economy Class seat that may have extra legroom due to the position of the bulkhead. The tray table is in the armrest, making the armrest immovable and slightly reducing seat width. There is no floor storage for this seat during take-off or landing. 30 F None No Power Seat 30 F is a standard Economy Class seat that may have extra legroom due to the position of the bulkhead. The tray table is in the armrest, making the armrest immovable and slightly reducing seat width. There is no floor storage for this seat during take-off or landing. 30 G None No Power Seat 30 G is a standard Economy Class seat that may have extra legroom due to the position of the bulkhead. The tray table is in the armrest, making the armrest immovable and slightly reducing seat width. There is no floor storage for this seat during take-off or landing. 30 H None No Power Seat 30 H is a standard Economy Class seat that may have extra legroom due to the position of the bulkhead. The tray table is in the armrest, making the armrest immovable and slightly reducing seat width. There is no floor storage for this seat during take-off or landing. 36 A None No Power Seat 36 A is a standard Economy Class seat whose proximity to the lavatories may be bothersome. 36 B None No Power Seat 36 B is a standard Economy Class seat whose proximity to the lavatories may be bothersome. 36 C None No Power Seat 36 C is a standard Economy Class seat whose proximity to the lavatories may be bothersome. 36 D None No Power Seat 36 D is a standard Economy Class seat whose proximity to the lavatories may be bothersome. 36 E None No Power Seat 36 E is a standard Economy Class seat whose proximity to the lavatories may be bothersome. 36 F None No Power Seat 36 F is a standard Economy Class seat whose proximity to the lavatories may be bothersome. 36 G None No Power Seat 36 G is a standard Economy Class seat whose proximity to the lavatories may be bothersome. 36 H None No Power Seat 36 H is a standard Economy Class seat whose proximity to the lavatories may be bothersome. 41 A None No Power Seat 41 A is a standard Economy Class seat that has extra legroom due to the Exit Row, however, the proximity to the lavatories may be bothersome..
41 B None No Power Seat 41 B is a standard Economy Class seat that has extra legroom due to the Exit Row, however, the proximity to the lavatories may be bothersome..
41 G None No Power Seat 41 G is a standard Economy Class seat that has extra legroom due to the Exit Row, however, the proximity to the lavatories may be bothersome..
41 H None No Power Seat 41 H is a standard Economy Class seat that has extra legroom due to the Exit Row, however, the proximity to the lavatories may be bothersome..
42 C None No Power Seat 42 C is a standard Economy Class seat whose proximity to the lavatories may be bothersome. 42 D None No Power Seat 42 D is a standard Economy Class seat whose proximity to the lavatories may be bothersome. 42 E None No Power Seat 42 E is a standard Economy Class seat whose proximity to the lavatories may be bothersome. 42 F None No Power Seat 42 F is a standard Economy Class seat whose proximity to the lavatories may be bothersome. 5 H None No Power Seat 5 H is a standard Business Class seat. 52 F None No Power Seat 52 F is a standard Economy Class seat however, other flyers tend to bump into this seat. 56 B None No Power Seat 56 B is a standard Economy Class whose proximity to the galleys may be bothersome. 56 D None No Power Seat 56 D is a standard Economy seat in the last row of the aircraft that may have limited recline. The proximity to the lavatory and galleys may be bothersome. 56 E None No Power Seat 56 E is a standard Economy seat in the last row of the aircraft that may have limited recline. The proximity to the lavatory and galleys may be bothersome. 56 F None No Power Seat 56 F is a standard Economy seat in the last row of the aircraft that may have limited recline. The proximity to the lavatory and galleys may be bothersome. 56 G None No Power Seat 56 G is a standard Economy seat in the last row of the aircraft that may have limited recline. The proximity to the lavatory and galleys may be bothersome. 56 H None No Power Seat 56 H is a standard Economy seat in the last row of the aircraft that may have limited recline. The proximity to the lavatory and galleys may be bothersome. 57 A None No Power Seat 57 A is a standard Economy seat in the last row of the aircraft that may have limited recline. The proximity to the lavatory and galleys may be bothersome. 57 B None No Power Seat 57 B is a standard Economy seat in the last row of the aircraft that may have limited recline. The proximity to the lavatory and galleys may be bothersome. 6 A None No Power Seat 6 A is a standard Business Class seat. 6 D None No Power Seat 6 D is a standard Business Class seat. 6 F None No Power Seat 6 F is a standard Business Class seat. 6 H None No Power Seat 6 H is a standard Business Class seat. 7 D None No Power Seat 7 D is a standard Business Class seat. 7 F None No Power Seat 7 F is a standard Business Class seat. 7 H None No Power Seat 7 H is a standard Business Class seat. 8 A None No Power Seat 8 A is a standard Business Class seat whose proximity to the galleys and lavatories may be bothersome. 8 D None No Power Seat 8 D is a standard Business Class seat whose proximity to the galleys and lavatories may be bothersome. 8 F None No Power Seat 8 F is a standard Business Class seat whose proximity to the galleys and lavatories may be bothersome. 8 H None No Power Seat 8 H is a standard Business Class seat whose proximity to the galleys and lavatories may be bothersome. Each seat has a personal TV featuring Audio Video on Demand (AVOD) with individually controlled music. Each seat has a personal TV featuring Audio Video on Demand (AVOD) with individually controlled programs and entertainment. Each Business and SAS Plus seat has an AC power port, while power ports are shared between every two seats in Economy. Complimentary Wi-Fi is availble to all Business and SAS Plus flyers. Wi-Fi is also available in Economy but at a fee. SAS always serves complimentary coffee, tea, and water onboard regardless of the time of day. Depending on the flight, SAS Plus passengers will receive their meals free of charge. All passengers can purchase a large selection of sandwiches, meals and salads, and a variety of carbonated beverages from the SAS CloudShop, Our Café. 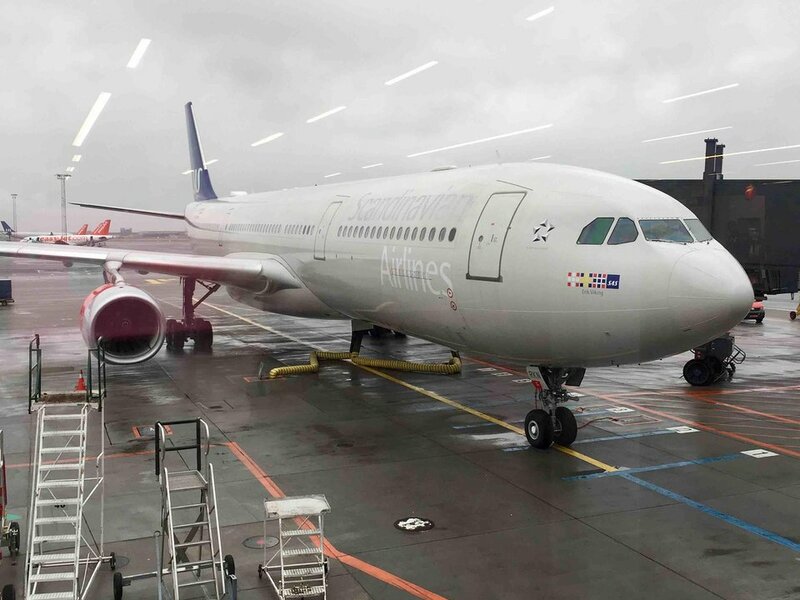 SAS operates this Airbus A330-300 on long-haul routes and features a three class configuration with 32 Flat Bed Business Class seats, 56 SAS Plus seats, and 174 standard Economy Class seats. Passengers travelling with the SAS Plus service receive additional benefits including: tickets can be changed and refunded for free, 24-hour money-back guarantee, 2 pieces of baggages up to 50 lb/23 kg per person, child discount, internet check-in by SAS app, SMS or at the airport, mobile boarding pass, choose your seat free of charge (front of aircraft), newspaper, coffee and tea included, breakfast always included, food and drinks onboard included, WiFi access on board included where available, 200% EuroBonus points, access to lounges, access to Fast Track where available. I highly recommend the seats closer to the window as they provide more privacy and better views. The footwells were larger than I expected and I found them to be practical. The seat is great and there is a lot of storage just like all other seats in this cabin. Seat 1H from EWR to OSL. Very comfortable ride up front. Bigger than normal foot well as it is in the bulkhead. IFE had to be rebooted a couple of times because the remote kept creating erratic randoms clicks causing the movies to jump around. The east coast flight time doesn't leave much time for sleep if the full dinner service is accepted which can be a bit slow though food and service is top notch. No less sense of privacy compared to the seats closer to the window (when standing everyone can see you anyway). Movie selection is not as large as other airlines, but suitable for an overnight flight where sleep is the driver. Fantastic seat (as economy goes). Due to tapering of fuselage, this pair of seats is set at an awkward angle. 51G is much closer to seat in front but 51H gave me (6'1') lots of spare legroom. Air crew were fine too, forget the fact that alcohol is only available to buy, I knew that when I booked. Would definitely book this seat again. Oh, the views of Greenland were stunning. the seat was awful and small, narrow and we had no room. But an amazing shout out to the flight attendants on this flight. they were so kind and amazing! thank you for making a long 8 hours flight pleasant! I love flying and have done so for 28 years. SAS has the best service I have experienced.The attendants were relaxed, friendly, and very helpful! The business class seats are second only to Emirates but the configuration is better. Each seat has access to the aisle. When traveling alone, reserve any of the window seats. Yes, the even numbered seats in business class have more privacy however the legroom when sleeping is a bit tight especially for side sleepers and getting in and out of the seat is alittle tight as well. This is only a minor issue however worth deciding if it is an issue for yourself. My next flight is approaching and I have reserved an odd numbered seat this time. Great Business Class seat with great space for your feet when sitting and laying on the lie flat bed. Furthest from lavoratory close to crew. There is a remote to control your tv which makes the extra space even better. This seat has less privacy than 2 H due to your cubby storage being on the window side so your seat is closer to the aisle. Reduced leg room due to aircraft construction. 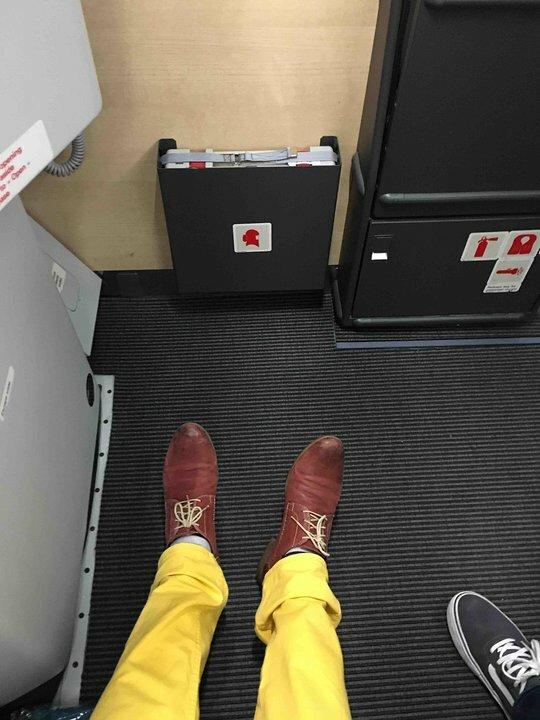 This seat has reduced legroom due to the construction of the plane. This seat is one of the best for the mid section of the business cabin. It has a shelf as a wall towards the aisle, and the shelf/wall for the 4F seat makes it into a "pod" with a high level of privacy. Only complaint was the limited storage space getting things out of sight without having to store it in the bins above. SAS effectively does recognize or respect pre-selected and will randomly reassign passengers to any seat - typically the last seats in the plane - to maintain "weight balance" of the plane. This seat is simply horrible with misaligned angle with seat in front and limited leg room. Furthermore, weight seemed to balanced solely by passengers with non-nordic surname. Airline is a complete joke. Flight was half empty. Not surprising given the truly offensive service and attitude of staff. The armrest is on the window side which somehow obstruct the view (if you are into looking through the window). This seem to be the case for all odd numbered seats towards the windows. All in all very comfortable. Liked much the storage space. Very satisfied. This was an amazing flight for me. The only other time I have flown business was in the SAS cabin on the older planes (between CPH and SFO), so this new cabin is a definite improvement. The seat is very private with the table to the aisle. The power options meant that I got off the flight with everything charged. The seat reclines completely flat so for the first time in my life I actually got some sleep on a plane. There is a massage option which is subtle, but really makes a difference. The screen is really good - again, first time I have a better screen in the airplane than I have brought with me. The movie selection wasn't too bad - got to see a couple of movies that I didn't get around to going to see in the cinema this year (which is what I expect and want from long haul). The editing wasn't too egregious either. The staff were all really nice, and attentive, especially during the meal service.. The food was a good selection and well cooked and there were plenty of drinks and snacks available. The wifi was surprisingly good and stable. That definitely exceeded my expectations. I managed to get quite a lot of work done. The comfort pack had the usual toothbrush/paste, socks mask combo with some nice handcream and lip balm. The bedding was pretty good I think - at least I wasn't complaining. I've stayed in hotels in Finland with worse. All in all, a really pleasant experience - made long-haul a little bit of a pleasant experience for a change. If you"re 2 people and want to fly together' the row 1e/1f, is perfect. The front toiletes aren't open to the public. So no annoyance due to folks visiting the rest rooms... If alone, choose the even rows (2,4,6,...) much more privacy due to the seats configuration. This seat must be one of the best on SAS economy even though it's far back of the airplane. I had additionally 3/4 of space compared to all the other seats in economy + one extra table. Due to extra space you have to give up something and in this case it's that the screen is not perfectly centered. Flew from Stockholm to Newark. 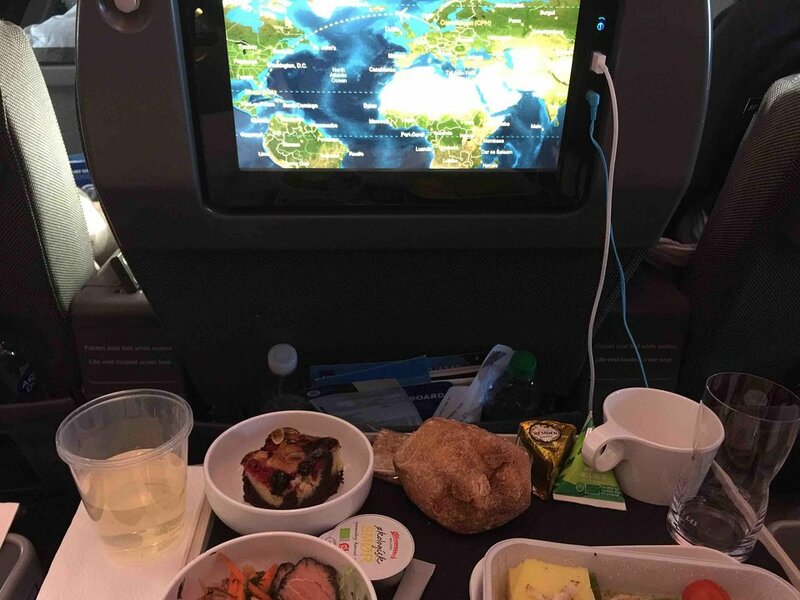 The flight was very comfortable compared to US carriers I have flown to and from Europe. Both flights arrived timely and the seats and service were fine. Liked the large video screen for onboard entertainment The lounge was a nice feature of the Plus service along with two free bags. Regular coach seats are uncomfortable for a long haul flight. Didn't expect much recline, but the seat is stiff and unforgiving. I've been on better "thin" seats on other airlines. Too bad since it is a beautiful new plane. 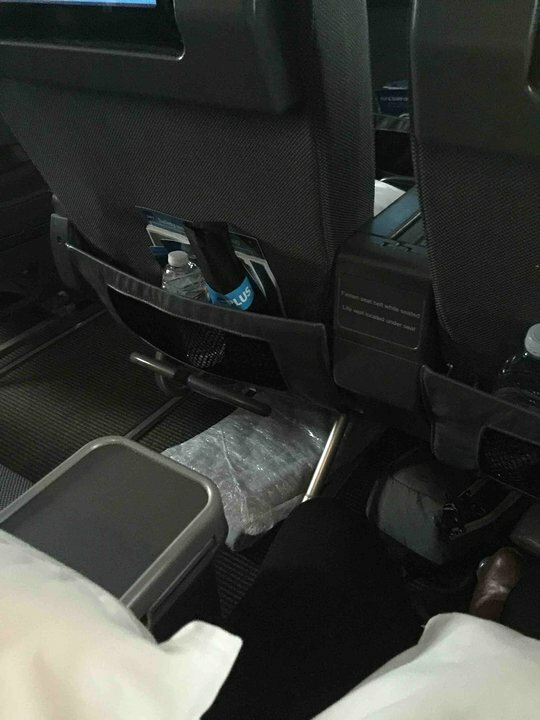 24A has something looking like an IFE box taking up space for your left foot. Significantly less foot space than for 24B. While the center seats do have the problems noted in previous comments, the outboard seats do not. They have enough legroom for an NBA center (although probably not enough width). For a red-eye flight where most people sleep, the traffic to the lavatories is negligible. These are the best bang-for-buck seats on the plane, IMO. Avoid this seat at all costs. To squeese in 3 seats in this last row SAS have made the seat narrower by at least 5 cm. You end up with your body sticking out into the aisle and you get bumped into every time the trolley or a oassanger passes. The 4 seats in the middle of row 30 is excellent. Legroom is better than SAS PLUS seats. The armrest between seat 30D and E folds up which is nice if you travel as a family. The seat cushion will slide forward slightly when the seat is reclined, which is a nice feature. All in all a great choice for seats. This seat is narrower than the standard seat due to the narrower cabin. Everything is nice with the new cabin, but why is the screen not able to angle up more? When the passenger in front of you rest his seat back, the angel of the screen is so pitched you must almost lie down in your seat to watch properly!! I flew this plane from ORD to ARN. The new cabin is stunning! Being 6"2'/1.88m this is one lie-flat I fit comfortably in. 8D is just in front of the snack-bar, so that could be bothersome with people getting up and walking past or standing behind you. I took this plane from O'Hara to Stockholm. I sat in seat 8A. The light from the galley / snack area is an issue, not sure why they don't put curtains up at the back of the business class section. Benefits to sitting in the back of business... you get off first since they load / unload passengers through door 2L. The seats are pretty nice, they have an air bladder system to adjust firmness. I've flown on the USAir / AA A330 and the SAS business seats have more width but less pitch relative to the AA A330. The seats which have the side table on the aisle side of the seat are better for privacy. The entertainment system is nice but movies titles are limited. First time I think I've ever seen a window in a airplane lavatory! Great staff, good food and the passenger areas of the plane are well maintained. Will fly again. The seats have even better leg room than the other ones in the business class. The cheapest economy seats on this plane are pretty good, especially compared to the US airlines I'm used to flying. Pretty comfortable, well laid out and the entertainment system is very nice. About 60 movies of varying vintage and genres available for free, plus lots of TV shows, and an on-demand moving map that's nice. Another nice touch is the USB port on the bezel of the screen so it's easy to plug in your phone without having to dig for ports under the seat or armrest. The system can play content from your phone but I didn't try that feature, I just used it for charging. I will definitely fly this airline when it's an option on routes I'm taking. The new business class seats are amazing. Fully-lie flat, 180 degrees as advertised, a lot of leg space for me as 1.86m person. Also plenty of private space. Feels like First frankly. The 170-degree angled seat, that I flew on my return flight on the A340, feels like a rock in comparison. The window seats on row 23 (both sides) is not as good as the other PLUSS seats. This is because of a feature in the wall that builds up a few more centimeters than anywhere else very close to the armrest. If you are a large person, this will be uncomfortable. Seats on row 30 have great additional legroom, but agree with other comment on seats C and F.
Feels private in front of the cabin, not much "foot traffic" around you. All the even numbered window seats are "true window seats" in the sense that the side table is the closest the aisle, while the seat it self is the closest to the window. The bulkhead row seats are not narrower than normal SAS PLUS seats; they all have tray tables in the armrests. Proximity of lavatories and gally not an issue as these are reserved for Business Class, there is no "traffic". This is an excellent seat! These seat are not that good in SAS new upgraded Cabin during the transfer. 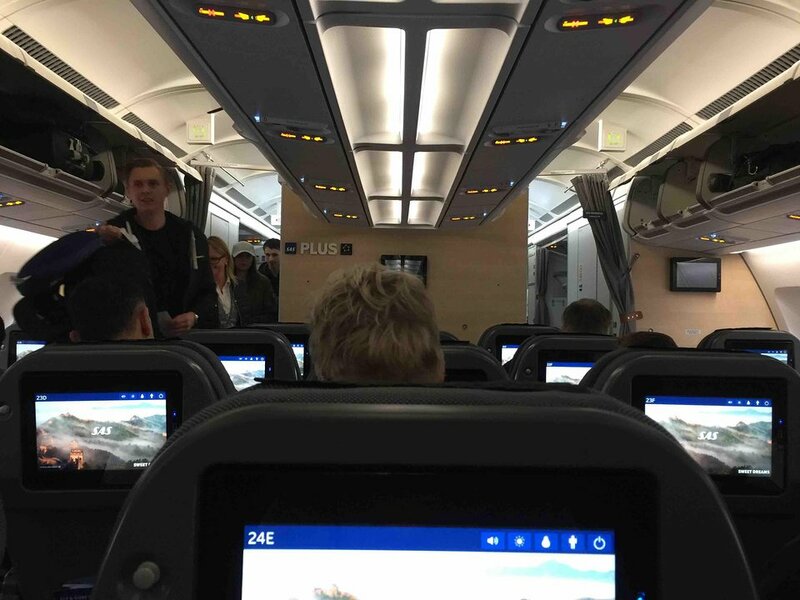 Because the curtains between SAS GO and SAS GO PLUS will hit your lap / face and coffeetable / entertainmentscreen everytime someone from SAS GO PLUS need to use the lavatory! VERY annoying! SAS flies 1 versions of Airbus A330-300.